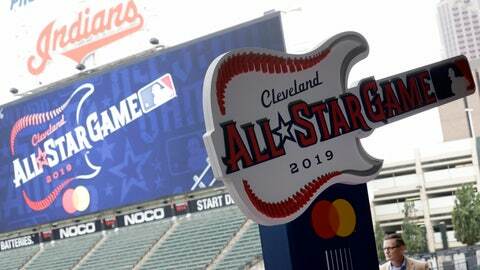 CLEVELAND (AP) — Cleveland’s rock ‘n’ roll roots will be on display for the 2019 All-Star Game. Inspired by the city’s deep musical history, the team unveiled the logo for next year’s game — a red-white-and-blue guitar with a body bordered with baseball stitching. The blending of baseball and music is a not-so-subtle reminder to the rest of the country that Cleveland rocks. The Indians are hosting the annual mid-season event on July 9 for a record sixth time. And next year’s game coincides with the 25th anniversary of Progressive Field, which was known as Jacobs Field when it hosted the 1997 game. Owner Paul Dolan, MLB Deputy Commissioner Tony Petitti, Cleveland Mayor Frank Jackson and Indians manager Terry Francona, All-Star shortstop Francisco Lindor and first-base coach Sandy Alomar, who hit the game-winning home run for the American League in ’97, attended Tuesday’s ceremony that officially begins the countdown to next year’s game. Plans for the logo began shortly after the team was awarded the game. Occi said one of the biggest challenges in designing a logo that can be used across a variety of platforms — from merchandise to uniform patches to being painted on the field. Under pressure from MLB and others, the Indians will no longer wear the contentious Chief Wahoo on their caps and jerseys starting next season. And while there has been speculation that Cleveland conceded to the move in order to host the All-Star Game, the team has insisted the timing was just coincidental. Dolan said there was no discussion about Chief Wahoo in designing the All-Star logo. Cleveland, which also hosted All-Star Games in 1935, 1954, 1963 and 1981, has long been considered the birthplace of rock after local disc jockey Alan Freed coined the term “rock and roll.” The Rock & Roll Hall of Fame opened one year after Jacobs Field, and the two structures have been linked to the city’s downtown rebirth. The Indians and MLB officials have met with the Rock Hall about being incorporated into festivities around next year’s game.